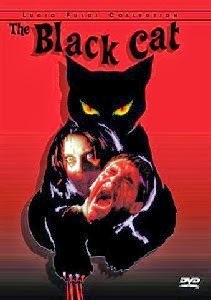 Italian Gore-monger Lucio Fulci took a break from his graphic-violence gore fests with 1981's "The Black Cat." Held in low esteem by his fans, "The Black Cat" is actually a pretty good gothic horror film. This time Fulci relied more on a coherent story, moody camera work and pacing to deliver the creeps rather than the buckets of blood he is famous for. The story revolves around Mr. Miles (Patrick Magee), a psychic who is trying to contact the dead. Magee lives in a small English village which has begun to experience some mysterious deaths. Mr. Miles shares his house with a black cat which spends its time committing murder and attacking Mr. Miles. Visiting the town is Jill Trevor (Mimsy Farmer), an American photographer studying local ruins. After several killings, the local constable calls in a detective from Scotland Yard. As the bodies pile up, Jill begins to suspect that Mr. miles has some kind of mental control over the cat which causes it to kill. The film's story is fairly simple. While not a great movie, I enjoyed it immensely more than Fulci's "House by the Cemetery." The acting is quite good. Typical of Italian movies, the sound was added late. In the case of "The Black Cat" the dubbing was very good. I love Magee's unique voice. His intense facial expressions are used to great effect here. Unfortunately, Fulci again relies on extreme close-ups of his character's eyes to create tension, menace and pass for character development. His propensity for the facial close-up doesn't seem so ridiculous in this case because he has a good script backing up his direction. The film was lambasted by fans of Fulci upon its original release. Fulci himself said he did the film as a favor to a producer. Maybe because I am not a fan of Fulci, I was able to enjoy this film more than his legion of gore fans. I had no expectations going into the film. I was happy with what I saw. Closer in tone to the gothic Hammer films of the 60s than to the horror films being produced during the height of slasher-mania, "The Black Cat" holds up well today. To me it was worth the price of admission. There is a very good score by famed Italian movie composer Pino Donaggio. One of three DVDs put out by Anchor Bay for the fan's of gore director, Lucio Fulci. Short on gore with the emphasis on mood and acting. I liked the movie. Not a great movie by any stretch of the imagination, but a good one. The disc is typical of Anchor Bay in that it is technically superb. Not a lot of extras. I thought the picture was superior to Fulci's "House by the Cemetery" also from Anchor Bay. There is more night photography and relience on shadows and fog. All in all very good visuals. Superior sound. I did find the cat's menacing growl to be a bit annoying after a while. Fulci modulates the sound to rack up the tension, shock and suspense. Pino Donaggio's excellent score is a highlight. Nothing special. Simple stills from the movie. Easy to navigate, gets the job done. Not much there. There is a 10 screen bio and filmography of Fulci. Get this one for the movie. Whether you rent or buy this DVD will depend on your tastes. More valuable to horror fans. Fulci's gore fan's might not appreciate this one. It replaces plot, solid acting and a good script for the mindless slaughter of women.